Strawberry Champagne Jam is THE jam to make to celebrate, to give as a gift, and to savor the flavor of spring. This post will explain how to make the Strawberry Champagne Jam so you can eat it fresh, it will give clear, beginner friendly canning directions for how to preserve it in canning jars (even if you never have before!) so you can enjoy it later, and will link to the best jars for gifting this super special jam! Read on for the recipe- it is much easier than you think and there are a few simple pro tips for keeping that champagne flavor in the jar! I wrote a post about how to can for party favors where I shared making raspberry champagne jam for my dear friend’s bridal shower, and I got a lot of questions about how I made that jam. Including champagne is fun because it adds a layer of celebration and festivity to your preserve but it is a little tricky because the flavor cooks off really quickly so I had to make several batches to figure out the best, most reliable way of including the champagne at the last minute without making the jam too thin. The result is my family has tons of this jam on the shelf (yay us!) and the following recipe. I use the extra big bottles of Cook’s champagne because it is frequently on sale for $10 at my local grocer and I usually am making many batches. YOU can use whatever champagne you’d like. You only need 1 cup, and it doesn’t have to be fizzy anymore so flat champagne or flat sparkling white wine or rose is fine. Leave red wine for a beef bourguignon recipe. If you’ve clicked over to this recipe, but aren’t sure how to can, don’t worry! I have a completely free Canning Basics email course you can sign up for that will teach you exactly what to do! I’d like to receive the free canning basics email course; that way I can learn from my inbox too! Pro Tip: Be completely ready to put the preserve into the canning jars when you add the champagne + pectin mixture into the berries. You want to pour it in, give a quick stir, and start ladling it into jars. BEFORE you add it, the jars should be hot (or warm if you are using a steam canner), you should have your ladle, canning funnel, jar lifter, and jars already. Which Canning Jars Should You Use? This recipe, in particular, is very giftable, full of spring flavor, and is a pretty red-pink color. I would encourage you to can it in small half pints like these, which hold one measuring cup of a jam if you intend to keep it yourself. I’ve yet to have any arrive broken. Winning! If you are giving these as shower favors, I would suggest these awesome options for jars. These Elite Collection jars are different looking, still hold one measuring cup of jam, and aren’t as readily found in stores. I LOVE them and you will too. Finally, the smallest jars of all. These 4-ounce canning jars are amazing because they take a regular size lid (so handy!) and are perfect for things like hot sauce, salsa, or other rich or spicy recipes. They make it practical to gift a home-canned item at a large gathering because it’s about 1-2 serving sizes (my husband and I use probably 3 of the four ounces of jam total on our French toast, for example). In most of my jam recipes, I use powdered pectin simply because it is inexpensive and I’ve never had any trouble using it or whisking it smoothly into my jam to thicken it. That said, I chose to use the slightly more expensive (hardly so– it’s just a few dollars a package) liquid pectin to thicken the champagne BEFORE incorporating into the berries. This technique works well and I think you’ll find it to be very easy indeed. 1. Prepare your water bath canning pot or your steam canner. Fill the water bath canning pot with water, add 8 half pint jars, or 14 tiny 4-ounce jars and bring to a boil OR fill the steam canner to fill line and turn on low with the 8-pint jars nearby on a towel-covered countertop. 2. Combine strawberries and water and simmer together in a preserving pan (a heavy-bottomed, wide pan) and stir occasionally for 15 minutes. Mash with a wooden spoon or potato masher when berries are soft. 3. Optional: Remove from heat and ladle into a food mill fitted with a medium plate. Process jam through for a super smooth jam. 4. Return strawberries to a boil, add sugar and cook on low while you complete the next step. 5. Whisk pectin into champagne, noticing as you whisk that the pectin will thicken the champagne to the consistency of thin pancake syrup. Add champagne mixture to strawberries, reduce heat to very low, and immediately proceed to the next step. 5. Ladle into jars one at a time, apply lids and rings, and either submerge into the boiling water of the boiling water bath with a jar lifter OR set gently on the rack of the steam canner. 6. Process for 10 minutes PLUS 5 minutes for every 1000 ft above sea level. Remove from heat, rest jars carefully on towel-covered countertop. Label cooled jars and store for up to 1 year. Print the free version of this Strawberry Champagne Jam Recipe right here! Success! Now check your email to confirm your subscription and download your PDF of the Strawberry Champagne Jam recipe! Download the completely free Canning Equipment Checklist! You’re in! Check your email for the PDF that you can download and print for free! I’d like to receive the free canning basics email course too! Have you put that handy dandy Canning Equipment Checklist to good use yet? Want to take your canning education to the next level? 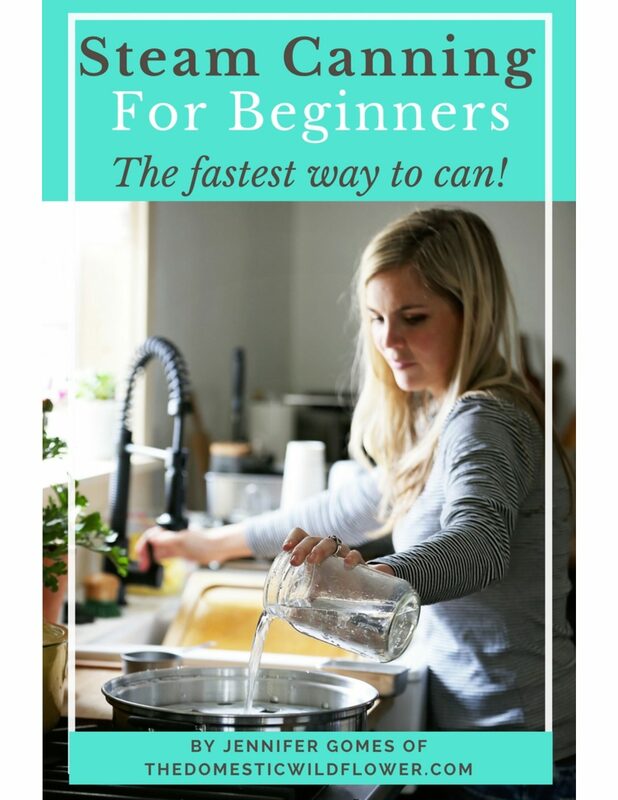 Head to www.startcanning.com and enroll in the E course for busy beginners! Wondering about the steam canner I refer to? Read this post here to learn about the fastest way to can. Want to know more about the food mill I reference above in the recipe? I have a post all about how they are one of my favorite tools for the smoothest jam around! Can you put the tiny jars in the steam canner?